This comfortable low-rise 2 bedroom 2 bath second floor oceanfront end unit is located in the quiet, family oriented Windy Hill section of North Myrtle Beach is directly on the beautiful beach of this year-round resort town, just footsteps from the ocean. There is plenty to enjoy in all seasons. In Winter 2008 the building was sided with new vinyl siding, shutters and new railings on the balconies. All new windows were installed as well. We are on the second floor and this building does not have an elevator. This complex is not a hotel and all units are privately owned by individual owners. In April 2014 we had new vanities installed in both bathrooms. The hot water heater and Central Air Conditioning/Heating unit were replaced. This beautifully furnished and well maintained home away from home has tile floors in the kitchen, living room and both bathrooms. There is carpeting in both bedrooms and the hallway. Our place offers a full-size fully equipped kitchen with dining area and a new oven range in September 2018. The living room has sliding glass doors that lead to the balcony where you can enjoy the sounds and view of the ocean. There is a new (September 2015) queen size sleeper sofa for additional sleeping space and for your viewing entertainment there is a new 43” flat screen TV and cable (February 2019). Wifi internet access is also available at this complex. The master bedroom has a king-size bed, private bath and a 32" flat screen television with Cable. You also have a direct view of the ocean from this bedroom. The second bedroom has a queen size and 32" flat screen TV with cable that is also ideal for playing video games. Each bedroom has sufficient closet space to meet your needs. Also, there is a laundry room in the condo with a high efficiency washer & dryer, on site parking for two vehicles and an oceanfront pool. Parking tags required which we will provide. Sheets and bath towels are included on all weekly rentals. The cleaning service provides a trash bag in each can, a roll of toilet paper in each bathroom and a roll of paper towels to get you started. You need to bring any extras as well as dish soap, dish detergent, laundry supplies, hair dryer, bath soap, etc. We are close to Barefoot Landing, Restaurant Row and just a short drive from Broadway at the Beach and other wonderful Myrtle Beach attractions. We are about 30 minutes from North Myrtle Beach airport. There are many fun activities to enjoy for all ages. We also have another oceanfront 2 bedroom 2 bath condo at Windsong (#52803) which is only a short two blocks away and is similar to this one if you are looking for an additional unit. If you are looking for a larger condo we have two 4 bedroom 3 bath oceanfront condos at Crescent Shores (#25402) and (#1083486) in the Crescent Beach section. From May 18 to September 7, 2019 rentals are weekly and Saturday to Saturday only. Monthly rentals available September thru April. Daily rentals available during the off season months. Our condo offers all the amenities of home so please give us a call if this is the vacation place for you. We live in Lansdale, PA and own three other condos in the North Myrtle Beach area, VRBO listings 52803, 25402 and 1083486. We have been coming to North Myrtle Beach since 1996 and enjoy coming visiting every year. 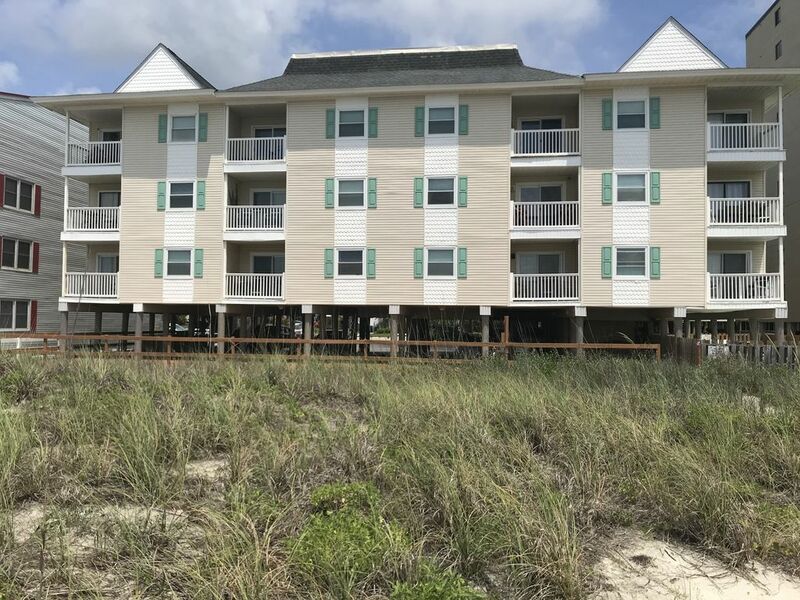 We love the Windy Hill section of North Myrtle Beach for it's quiet family beach and this building is directly on the beach footsteps from the ocean. We love the beach look of the condo and the ocean front view of the beach and ocean. Bathroom in the master bedroom has a walk in shower. Need to provide your own bath soap, shampoo and hair dryer. Cleaning service supplies a roll of toilet paper in each bathroom to get you started. You will need to bring any extras. The cleaning service supplies a starter bag in each trash can, a roll of toilet paper in the bathrooms and a roll of paper towels. You will need to supply any extras. Just like sitting on the beach! We spent an amazing week in this condo. Felt like home. Look forward to staying again. Highly recommended! Windy Hill condo was very comfortable for our 3 day weekend getaway. It's an older building but overall it provided us with what we needed and the view was wonderful. It's very close to the beach and sitting on the deck it almost feels like you can touch the sand. This unit in Windy Hill was a really good value for an easy beachfront stay. The actual place looks better in person and the pictures online should be updated. The location cannot be beat, especially if most of your time is spent outside on the beach. The down side: The listing does not tell you up front all the things you have to bring. We only found out after we booked. You have to bring all of your own bed linens, dish towels, bath towels, dish soap and dishwasher detergent, and dish sponge. The unit is definitely in need of being treated for pests, as we saw a few roaches and spiders. Overall, the low season price makes this place a good value because of the beachfront location. Thank you for the feedback. We are directly on the beach and love the oceanfront views. We will be updating pictures soon as some upgrades were recently made. After these renters stayed we hired a new cleaning service and they provide sheets and towels so we are now including them with all our rentals. The service does not supply dish towels, dish cloths or pot holders so you will need to provide these. The service gets you started with a trash bag in each can, a roll of paper towels and a roll of toilet paper in each bathroom. You will need to bring any other supplies that you will need. The units are treated monthly by a pest control company and we will immediately have them treat again. We agree that this is a great location for a quiet beachfront stay. The area is great for families looking for a fun beach vacation. Thank you for your consideration. You can not beat this location. This is a laid back neighborhood, but close to all the action. You are close to the outlet mall, shopping, restaurants, and more. The beach here is only moderately crowded even during the middle of the day. The view from the deck is awesome. The bed and the couch is comfy. The kitchen is great for preparing basic meals. The property is quiet for the most part. Overall, we enjoyed our stay, and we are hoping to come back. My friends and I had a great stay here! The condo is right on the beach. You can't beat the balcony that overlooks the ocean view. The condo is also very close to barefoot landing where there are restaurants. We went to a concert at the house of blues which is also only about a mile walk! Would definitely recommend this condo! Stayed here a few days during Spring Break. Great place right on the beach. Was quiet and beach was not crowded. Close to shopping and restaurants. Condo was as pictured in listing. Michele and Dennis were very easy to work with and answered all our questions. Departure cleaning is included. Sheets and Towels Provided on Weekly Rentals Only. No Pets Allowed. No Elevator Available. From May 19 until September 7 rentals are Saturday to Saturday only.